But, when I switched back to my regular dip pen with gouache, it seemed much better. 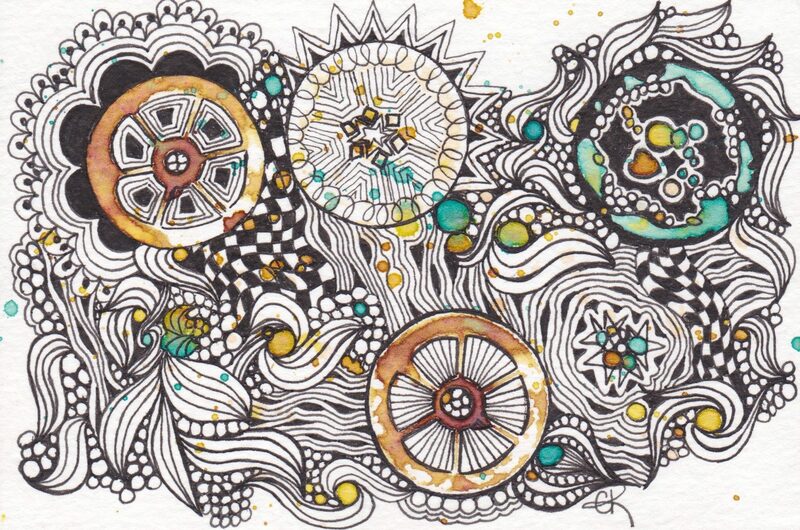 I am finding the Zentangle tiles a bit tricky, as they seem pretty rough and fibrous. Smoother papers work better for this. So that led me to try some Kuretake Gold Sumi Ink I had on black Artist Tile paper that I cut to a Zendala size. And what better way to practice than on this week’s Diva Challenge (#315) for a foray into Molygon. Molygon was featured on Kitchen Table Tangles with Rick & Maria on the Zentangle Mosaic App this week, and after watching the video, I thought I would give it a shot with my golden ink. I figured to not do any shading on that, but I may go back later and try it with a gold Pan Pastel and see how that works. I have been VERY productive busy bee this week. Not only did I get a good portion of my office cleaned up, sorted, and filed, but I finished a few things. First up, another book from Cherryl Moote’s class at TangleU. The closure is a wooden dolphin that Elaine gave us on the last day as a reminder of the event, so I drilled some holes in him and used some muted turquoise ink to distress him a bit. I also finished my Visigothic Versals project from the workshop we had with Risa Gettler. I think we may hold it again in the fall, so don’t feel left out. It is a pretty big piece, so you would have to see it in person. And today, we had a great meet up with the San Diego Tanglers Friendship group at the Bernardo Winery. Nancy Robinson, CZT, gave us a great tutorial on Zen Gems, and I made this turquoise lovely. If you would like to see some great examples of how to draw and color these, check out this free download of Tim McCreight’s Practical Jewelry Rendering. Not only does it cover stones like this, but also cut gems, gold, silver, and pearls. And did I mention that it is free? I did a few more in my journal as well..
And I think I really like the new Dingbatz. So much that I managed to make a giant one on a journal page I was working on in an art journal. And in addition to all that, I drafted a new logo for the web page, but you will have to wait to see that. Gotta get to making dinner now! That’s it! I MUST get myself to a Tangle U.
Yes…I expect to see you in Oregon! Lovely little gold molygon moons floating out in space! Love the border too. Love all the pieces you shared this week. The gold Molygon is gorgeous, and I always appreciate seeing a great gem! What a lot of great art! Wow! Busy, productive week. Beautiful work. And thanks for the link to Tim McCreight’s download. I think it is a wonderful resource and am so happy to share it! Love it all but that golden molygon is extra special! What a busy week! You are showing so many beautiful pieces, I could never pick a favourite! I’m always exhausted by the time I finish reading your blog. You do soooooo much! And it’s lovely. The gold one makes me think og Japanese Chrysanthemums. Like you, I am enjoying the Dingbatz too. Wow! Lots of neat work! Love the gold molygon! Your book is lovely and what a neat way to use the dolphin as a closure. Also love your giant Dingbatz! Fun work! I’ll be in SF later this month for a Giants game. Hit me up, as I am trying to find an excuse to fly back later! Like the gold Molygon. There are some folks who only tangle with fountain pens. I had the blooping effect on a black tile with white ink. Was using a dip pen for that. Think the nib got caught on the paper and it emptied onto the paper. Is a challenge. Have not tried it on other paper.